The Department of Computer Science hosted the 9th annual Computational Thinking Competition for K-12 students. 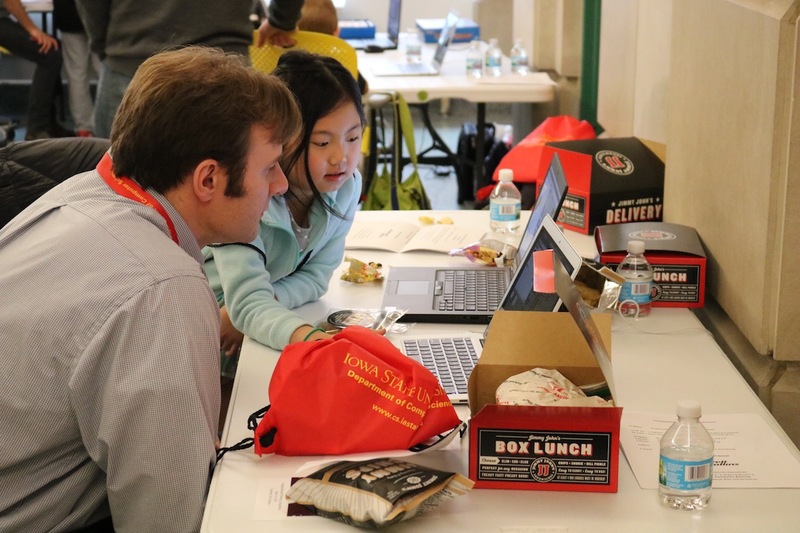 On April 14, 2018, the Department of Computer Science hosted nearly 30 students in K-12 for the 9th annual Computational Thinking Competition. The competition, co-sponsored by Rockwell Collins, helps students engage in computational thinking, a critical thinking skill that involves breaking down a problem into manageable pieces and working toward a solution in an organized manner which a computer could carry out. Students’ projects are judged by alumni in industry, K-12 teachers and computer science graduate students. “If it helps them learn how to think, helps them learn how to be confident in themselves, we are happy,” said Simanta Mitra, senior lecturer of computer science, and member of the outreach committee. 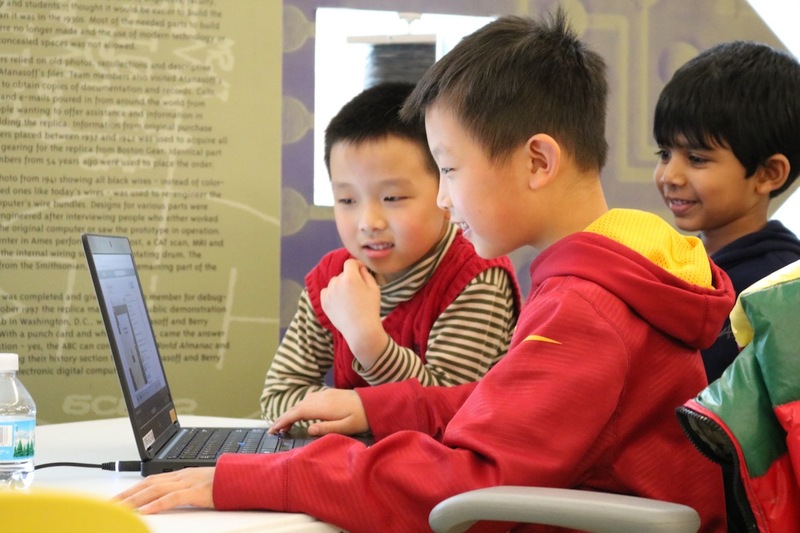 Iowa State faculty and students hold computational thinking workshops throughout the year for students in grades K-12 to learn about computational thinking and work on projects. At the competition, the students present projects to judges in a science fair format, with prizes awarded in four categories: Grades K-3, 4-6, 7-9 and 10-12. Prizes included laptops, tablets and Raspberry PIs. Students are allowed to come up with any project they want, but they must show their computational thinking through the process. Projects covered a wide range of topics and included literacy learning games, games to teach about global warming or the solar system, programs that calculate square roots or the time for an asteroid to hit the earth, electric field simulations and protein sequencers. “They get to decide what excites them and when they are excited about that particular topic they really get interested and really go deep into whatever they are researching,” said Soma Chaudhuri, associate professor of computer science, and vice chair of the outreach committee. 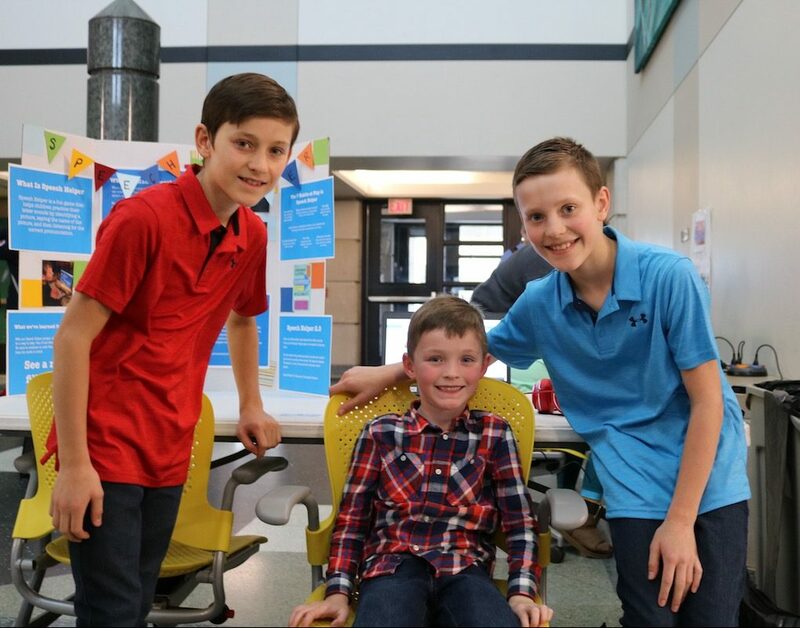 Carson (left) and McClain (right) Crigger, with Maddox, their younger brother, presentng their project, Speech Helper 2.0. Carson and McClain Crigger, both sixth graders at South Middle School in Waukee, created Speech Helper 2.0, a program designed to help their younger brother practice letter sounds. Their younger brother had many ear infections as a baby and needed speech therapy to improve his pronunciation of many sounds. The program was the second iteration of a game they had made in fifth grade for their school’s technology fair. In the game the user sees a letter or letter combination and several objects which start with that letter sound. The user identifies the name of the picture and then clicks on it to listen to the correct pronunciation. The updated version uses the next round of age appropriate letters they got from their brother’s speech therapist. It also addressed issues in the first game, which they found after having their younger brother test the original game. “Some of the photos he didn’t really understand so we went back and found photos that he understood,” McClain Crigger said. In the process they learned more about coding for the game as well. Carson and McClain said they enjoyed presenting their project as well as seeing all the other projects at the competition. They received third place in Grades 4-6. Anika Shrotriya with her literacy learning game. Anika Shrotriya, a fourth grader from Fellows Elementary School in Ames, created a program called Literacy Learning, which includes games practicing sight words by hearing, seeing and writing them. It also has games that work on reading comprehension by reading a story to the user, having the user read the story independently and then taking a quiz on the story. The user receives badges for completing the games. This was Shrotriya’s fourth time participating in the competition. She first participated as a kindergartener and wanted to teach sight words to other kindergarteners. Since then she has continued building on that initial program. She received second place in grades 4-6. “I thought, ‘How can I make a program that will help people with reading comprehension and other skills?’” she said. She has learned to use the scratch programming language and is in the process of learning a new language, Python. The competition has made her excited about coding, which she hopes to do more of in the future. Neha Mehrotra, mother of Anika, sees how the competition instills confidence in working with computers and a deeper understanding of technology. 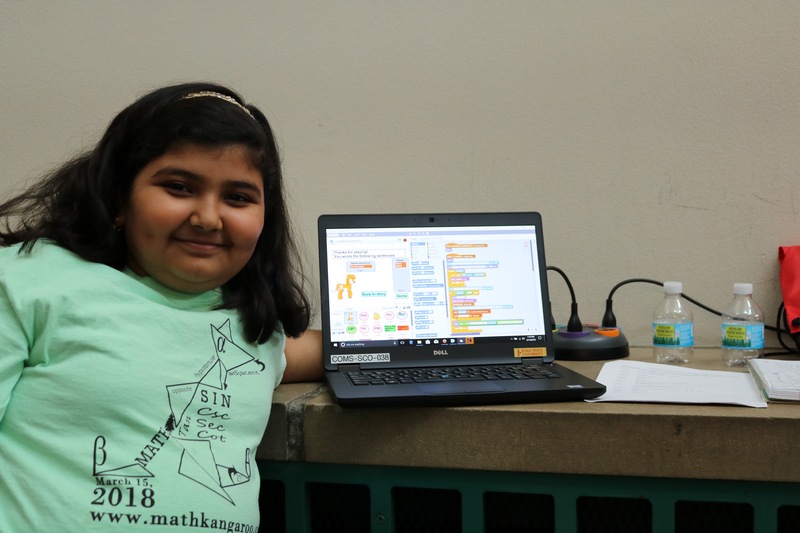 “I think every kid uses the internet these days and just knowing what happens in the background — how do you see that screen pop up and how do things change — to be able to make that happen through coding is very empowering,” she said. Adhitya Sivakumaran with his project, Alpha Uno. Adhitya Sivakumaran, from Brookview Elementary School in Waukee, created Alpha Uno, which teaches kids ages two through five about letters, numbers and basic math skills. 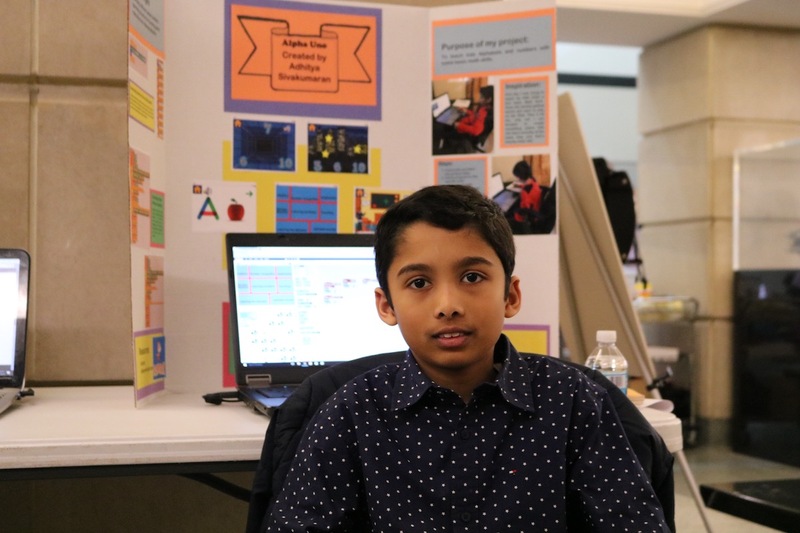 Sivakumaran, a third grader, had the idea for the project while trying to teach his sister a few math facts. It was his first time participating in the competition, which he heard about through his computer science teacher. He said he enjoyed seeing the projects made by other contestants and learned to have patience and the value of hard work. He won first place in Grades K-3.